To be honest, I’m not sure if Barney is guilty, guilty by association or been set up. All I know is that I had a very rude awakening this morning when Wayne walked out the back door and straight into a steaming pile of dog poop on the front doorstep. Barney and Mischa are Wayne’s dogs. 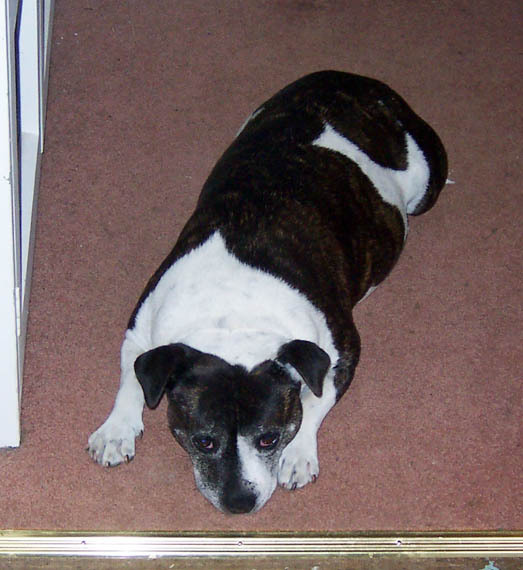 Mischa is a 7yr old, rotund staffie who has been known to fall over when climbing the steps and roll back onto the lawn, waving her short little legs in the air as she goes. Barney is her illegitimate 6yr old son, the product of an illicit romance between Mischa and a smooth talking young spoodle. To be fair, Mischa was young and easily led astray, so I don’t hold the scandalous affair against her. Mischa and Barney came to live with us at Wind Dancer Farm and originally set up house in the garage. 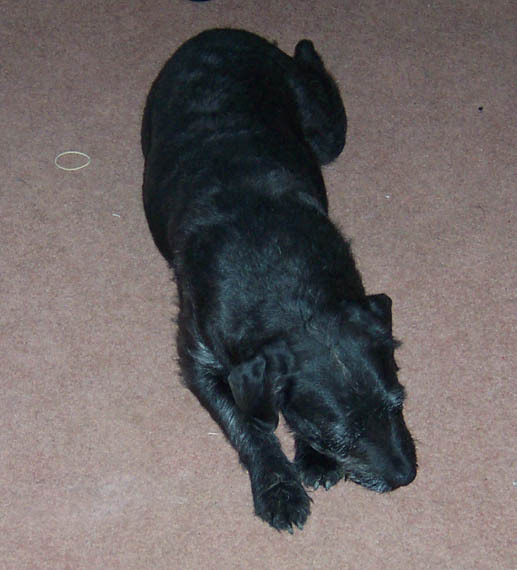 They’ve always been outside dogs… Mischa was also an escape artist so they spent most of their lives in various forms of Stalag 13 or Alcatraz for dogs, only let out when Wayne was home to keep an eye on them. Things went smoothly for a while… till I got the bright idea that they’d like to sleep on the tiny deck (now enclosed as a mud room). I put dog crates on the deck and covered them over to create nice warm caves for them and they were quite happy there. But that wasn’t enough… I felt sorry for them having to stay outside while the rest of us were inside. So, while Wayne was away I moved them inside. At first they slept in the tiny entrance and slowly, they creeped into the office. I drew the line at the living room. That’s non-shedding dog territory… and non-house peeing dog territory. All went fine for a while – there were some accidents along the way but all in all, not too bad – till two mornings in a row I found pee in the office. I had enough. Back to the mud room they went. The problem isn’t that they can’t hold it. Its that they (he) won’t. They’d never been toilet trained as they were outside dogs, so I would make them go out to pee before bedtime. Made being the operative word. I had to bully them into going out. Then I’d have to stand there while Mischa (who learned quick) would pee and go back inside. Barney would sit and skulk and stare dolefully at me and not pee. Despite the fact that I praised the hell out of him when he did pee. So, out to the mudroom they moved. ie back to where they were before, only this time the area has walls. Again, all went well for about a week or so, they seemed quite happy to be in the mud room in their comfy bed. Till this morning. And the fresh steaming pile of doggie do on the mud room rug, right at the front door. I was trying not to wake up when a barrage of swearing assaulted my ears. I jumped out of bed and ran thinking something horrible had happened. First thing that hit me was the smell. Then the sound of Wayne gagging as he hopped around on one leg. Squishing mud between your toes is meant to be fun. Dog poop, not so much. Neither was I. Rug tossed out onto the lawn. Poop scooped. I think Barney and Mischa are going to be moving to the garage again soon… full circle.